A Lunar Eclipse (Eclipse of the Moon) occurs when the Full Moon passes into the Earth's shadow. The Moon is lit by sunlight. When that sunlight is cut off, the Moon should disappear. It does not vanish completely, however. The Earth has an atmosphere. Sunlight can bend around the atmosphere and reach the Moon. The thick atmosphere only lets red light pass. This causes the eclipsed Moon to appear a coppery red colour. There are two types of lunar eclipses. A total eclipse of the Moon can last for as long as 1 hour 43 minutes. During the partial phases, the Earth's shadow appears curved on the Moon. The ancient Greeks used this observation to postulate that the Earth was a sphere. Lunar eclipses are less frequent that solar eclipses. There can be as few as NONE in a calendar year and as many as THREE. Unlike a solar eclipse, a lunar eclipse is visible over more than half the Earth. As long as the Full Moon is above the horizon, the eclipse is visible. The Full Moon is above the horizon on those parts of the Earth where it is night. Although, lunar eclipse are less frequent than solar eclipse they are seen more often because, when they do occur, they are visible over a larger area. 10 December 1973 Partial approx 10% Newington Green, London, UK After midnight. Crisp and clear night. 4 June 1974 Partial approx 83% Alexandra Palace, London, UK Clear. Evening. 29 November 1974 Partial nearly total Alexandra Palace, London, UK Partial phases of a total eclipse visible just after sunset. Partially cloudy. 18 November 1975 Total 0h 44m Alexandra Palace, London, UK Evening. Clear sky. 16 September 1978 Total 1h 20m Alexandra Palace, London, UK Moon rose eclipsed. Clear evening sky. 17 October 1986 Partial almost total Tiberius, Israel Cloudy until the end of totality. Saw all partial phases with slight cloud. Was sitting in an outdoor cafe, looked up and saw the eclipse. 20 February 1989 Total 1h 20m Periyer National Park, Kerala, India Clear dark sky. Moon high up and near Regulus. 17 August 1989 Total 1h 37m Highbury, London, UK Very clear night. Moon low near the end. Very red, crisp shadow. 9 February 1990 Total 0h 43m Enfield, London, UK Cloudy beginning. Very dark eclipse. 9 December 1992 Total 1h 20m Walthamstow, London, UK Most of totality hidden by cloud. Very dark eclipse. Very clear for partial phases and beginning of totality. 3 April 1996 Total 1h 26m Highbury, London, UK Clear, cloudless sky. Nice curved umbra. Dark red during totality. Spectacular third contact. Glimpsed Comet Hykutake. 27 September 1996 Total 1h 10m Highbury, London, UK Clear cloudless skies after drizzle. Ghostly blue-red during totality. Moon very close to Saturn. Saw stars near the Moon through telescope. 23 March 1997 Partial approx 60% Highbury, London, UK Saw two thirds of a 93% partial eclipse then clouds covered Moon. Comet Hale Bopp clearly visible. 16 September 1997 Total 1h 03m Highbury, London, UK Moon rose eclipsed in mist. Totality visible through binocculars during gaps in clouds. Cloud thickened so partial phases not seen. 9 January 2001 Total 1h 02m Highbury, London, UK Some cloud. Partial phases very distinct. Missed first 15 minutes of totality (which was very dark). Spectacular third contact. Cloudless but misty for end. 8 November 2003 Total 0h 24m Hackney, London, UK Clear sky at the beginning; cloudy later. Totality glimpsed between cloud. Red and blue colours visible. After midnight. 4 May 2004 Total 1h 16m Alexandra Palace, London, UK Very cold. Glimpses of partial phases. Sky cleared during totality. Spectacular third contact. Moon very low. 28 October 2004 Total 1h 20m Hackney, London, UK After midnight. Cloudy with gaps thoughout eclipse; large areas of clear sky during totality. Crisp sharp shadow during partial phases; nice red and blue colours during totality. 7 September 2006 Partial 19% Alexandra Palace, London, UK At moonrise. 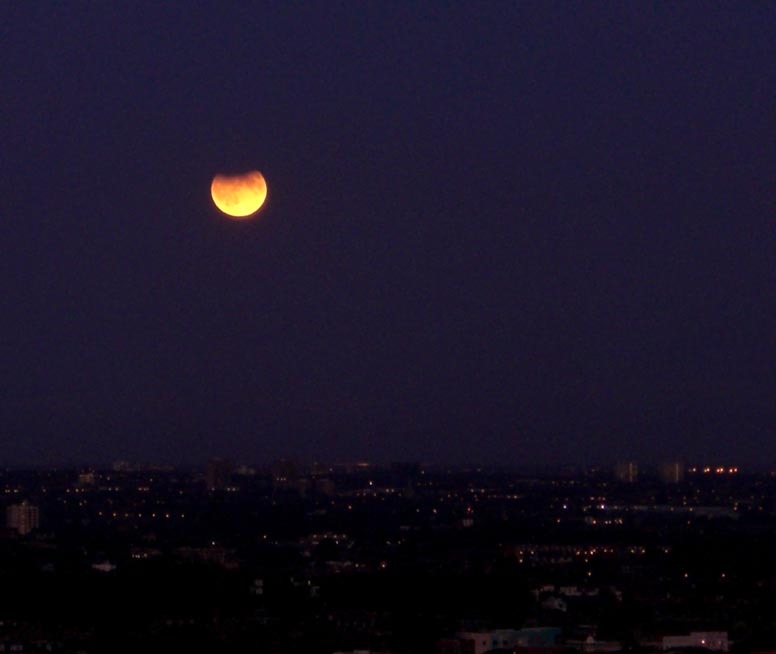 Very clear sky; clear umbra as the Moon rose over London; penumbra visible after eclipse end. 3 March 2007 Total 1h 14m Alexandra Palace, London, UK Very clear sky; Penumbra visible at beginning. Redness visible before totality. Totality dark in mid-eclipse, red later. Diamond-ring-like reappearance. Moon between Regulus and Saturn. 21 February 2008 Total 0h 52m Hackney, London, UK After midnight. Alternated between cloudy and thinner clouds. Glimpsed partial phases from about 40% onwards. Brief gap with Moon 80% eclipsed. Saw about half of totality. A very dark eclipse. Regulus and Saturn visible. Clouded over after 3rd contact. 17 August 2008 Partial 81% Osh, Kyrgyzstan After midnight. Missed the first 45 minutes. Saw maximum phases (slight cloud). Clear sky for final phases. Redness visible at maximum. 31 December 2009 Partial 8% Hackney, London, UK Early evening. Cloudy until maximum then clear enough to follow the umbra off the Moon and see a clear penumbra and a halo. 25 April 2013 Partial 2% Hackney, London, UK Early evening. Saw penumbral phase and the first five minutes of the partial before cloud. 28 September 2015 Total 1h 13m Hackney, London, UK After midnight. Perfect conditions. Clear skies. Very dark totality. 21 January 2018 Partial ~ 80% Cheshunt, UK After midnight. Cloudy. One minute gap for pre-totality partial (approx 80%). Several peeks of post-totality partial from main road.